Alihemati, Z., Navarchian, A. (2017). Response Surface Methodology for Investigating the Effects of Hydrolysis Reaction Parameters on Molecular Structure and Performance of Polyvinyl Alcohol as Primary Suspending Agent. Iranian Journal of Chemical Engineering(IJChE), 14(1), 52-66. Z. Alihemati; A.H Navarchian. "Response Surface Methodology for Investigating the Effects of Hydrolysis Reaction Parameters on Molecular Structure and Performance of Polyvinyl Alcohol as Primary Suspending Agent". 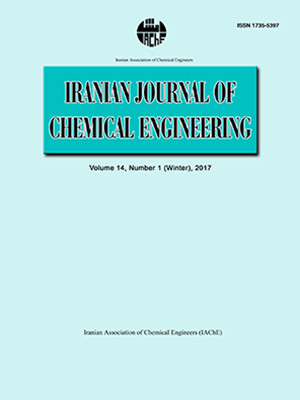 Iranian Journal of Chemical Engineering(IJChE), 14, 1, 2017, 52-66. Alihemati, Z., Navarchian, A. (2017). 'Response Surface Methodology for Investigating the Effects of Hydrolysis Reaction Parameters on Molecular Structure and Performance of Polyvinyl Alcohol as Primary Suspending Agent', Iranian Journal of Chemical Engineering(IJChE), 14(1), pp. 52-66. Alihemati, Z., Navarchian, A. Response Surface Methodology for Investigating the Effects of Hydrolysis Reaction Parameters on Molecular Structure and Performance of Polyvinyl Alcohol as Primary Suspending Agent. Iranian Journal of Chemical Engineering(IJChE), 2017; 14(1): 52-66. This study presents the synthesis of polyvinyl acetate (PVAc) by solution polymerization and its partial hydrolysis to polyvinyl alcohol (PVA) using alkaline alcoholysis. The influence of the molar ratio of hydrolysis catalyst (NaOH) to PVAc and the time and temperature of the saponification reaction on the degree of hydrolysis and molecular weight of the PVA were investigated using response surface methodology. Statistical analysis of the results revealed that the degree of hydrolysis and molecular weight of PVA were strongly dependent on the molar ratio of NaOH/PVAc. It was also found that the second-order interactions between the investigated parameters were not statistically significant. The optimal conditions for synthesizing PVA as a primary suspending agent were obtained as T = 45°C, t = 33 min and NaOH/PVAc (molar ratio) = 0.05. The chemical structures of the PVAc and the optimum PVA were studied by Fourier transform infrared spectroscopy. The distribution of acetate groups in the optimum PVA was determined using 13C nuclear magnetic resonance spectroscopy. It was found that addition of benzene as well as one-step addition of NaOH (when compared with drop-wise addition) result in more blockiness in the acetate group distribution of PVA. The performance of the optimum PVA was also investigated for a typical suspension polymerization of vinyl chloride and the particle morphology of the product was studied using scanning electron microscopy. Erbil, Y. H., Vinyl acetate emulsion polymerization and copolymerization with acrylic monomers, CRC Press, New York, USA, (2010). Kokabi, M., Sirousazar M. and Hassan, Z. M., “PVA–clay nanocomposite hydrogels for wound dressing”, Eur. Polym. J., 43(3), 773 (2007). Finch, C. A., Polyvinyl alcohol: Properties and applications, Wiley Publishing, London, (1973). Leszczyńska, A., Njuguna, J., Pielichowski, K. and Banerjee, J. R., “Polymer/montmorillonite nanocomposites with improved thermal properties: Part I. factors influencing thermal stability and mechanisms of thermal stability improvement”, Thermochim. Acta., 453(2), 75 (2007). Ormondroyd, S., “The influence of polyvinyl alcohol suspending agents on suspension polyvinyl chloride morphology”, Brit. Polym. J., 20(4), 353 (1988). Bao, Y. Z. and Brooks, B. W., “Influences of some polymerization conditions on particle properties of suspension polyvinyl chloride resin”, J. Appl. Polym. Sci., 85(7), 1544 (2002). Fabini, M., Bobula, S., Rusina, M., Macho, V. and Harustiak, M., “Preparation of Polyvinyl alcohol as the dispersant for suspension vinyl chloride polymerizations”, Polymer, 35(10), 2201 (1994). Navarchian, A. H., Joulazadeh, M. and Mousazadeh, S., “Application of the Taguchi approach to investigate the effects of clay content and saponification parameters on the tensile properties of polyvinyl alcohol/clay nanocomposites”, J. Vinyl. Addit. Techn., 19(4), 276 (2013). Navarchian, A. H. and Mousazadeh, S., “The effects of reaction variables on solution polymerization of vinyl acetate and molecular weight of polyvinyl alcohol using Taguchi experimental design”, Iran. J. Polym. Sci. Technol., 22, 341 (2009). Soltani, S., Asempour, H. and Jamshidi, H., “Investigation of reaction conditions for preparation of medium molecular weight polyvinyl alcohol as emulsifier”, Iran. Polym. J., 16(7), 439 (2007). Lee, S. G., Kim, J. P., Lyoo, W. S., Kwak, J. W., Noh, S. K., Park, C. S. and Kim, J. H., “Preparation of novel syndiotactic polyvinyl alcohol microspheres through the low‐temperature suspension copolymerization of vinyl pivalate and vinyl acetate and heterogeneous saponification”, J. Appl. Polym. Sci.,95(6), 1539 (2005). Garnaik, B. and Thombre, S. M., “Self‐association through hydrogen bonding and sequence distribution in poly (vinyl acetate‐co‐vinyl alcohol) copolymers”, J. Appl. Polym. Sci., 72(1), 123 (1999). Piirma, I., Polymeric surfactants, CRC Press, New York, USA, p. 110 (1992). Olabisi, O. and Adewale, K., Handbook of thermoplastics, 2nd ed., CRC Press, New York, USA, p. 58 (1997). Myers, R. H. and Montgomery, D. C., Response surface methodology, Wiley, New York, USA,(2002). Brooks, B. W. and Makanjuola, B. O., “Seeded emulsion polymerization of vinyl acetate: Order of reaction with respect to initiator”, Polymer, 23(1), 77 (1982). Roy, R. K., Design of experiments using Taguchi approach: 16 steps to product and process improvement, Wiley, New York, USA, (2001). Betianu, C., Caliman, F. A., Gavrilescu, M., Cretescu, I., Cojocaru, C. and Poulios, I., “Response surface methodology applied for Orange II photocatalytic degradation in TiO2 aqueous suspensions”, J. Chem. Technol. Biotechnol., 83(11), 1454 (2008). Montgomery, D. C., Design and analysis of experiments, Wiley, New York, USA, (2007). Brandrup, J. and Immergut, E., Polymer handbook,Willey, California, USA,(1989). Haweel, C. and Ammar, S., “Preparation of polyvinyl alcohol from local raw material”, Iraqi J. Chem. Petrol. Eng., 9, 15 (2008). Wang, B., Bao, X., Jiang, M., Ye, G. and Xu, J., “Synthesis of high‐molecular weight polyvinyl alcohol by low‐temperature emulsifier‐free emulsion polymerization of vinyl acetate and saponification”, J. Appl. Polym. Sci., 125(4), 2771 (2012). Wada, Y., Seko, N., Nagasawa, N., Tamada, M., Kasuya, K. I. and Mitomo, H., “Biodegradability of poly (3-hydroxybutyrate) film grafted with vinyl acetate: Effect of grafting and saponification”, Radit. Phys. Chem., 76(6), 1075 (2007). Zerfa, M. and Brooks, B., “Vinyl chloride dispersion with relation to suspension polymerisation”, Chem. Eng. Sci., 51(14), 3591 (1996). Kaczmarek, H. and Podgórski, A., “The effect of UV-irradiation on polyvinyl alcohol composites with montmorillonite”, J. Photochem. Photobiol., 191(2), 209 (2007). Yu, Y. H., Lin, C. Y., Yeh, J. M. and Lin, W. H., “Preparation and properties of polyvinyl alcohol–clay nanocomposite materials”, Polymer, 44(12), 3553 (2003). Garnaik, B. and Thombre, S. M., “Self‐association through hydrogen bonding and sequence distribution in poly (vinyl acetate‐co‐vinyl alcohol) copolymers”, J. Appl. Polym. Sci.,72(1), 123 (1999). Bugada, D. C. and Rudin, A., “Characterization of polyvinyl alcohol—acetate by 13C NMR and thermal analyses”, Polymer, 25(12), 1759 (1984). Wypych, G., Handbook of solvents, ChemTec Publishing, New York, USA, (2001). Etesami, N., Nasr Esfahany, M. and Bagheri, R., “Experimental study of the effect of reflux rate during suspension polymerization on particle properties of PVC resin”. Ind. Eng. Chem. Res., 49(5), 1997 (2010).